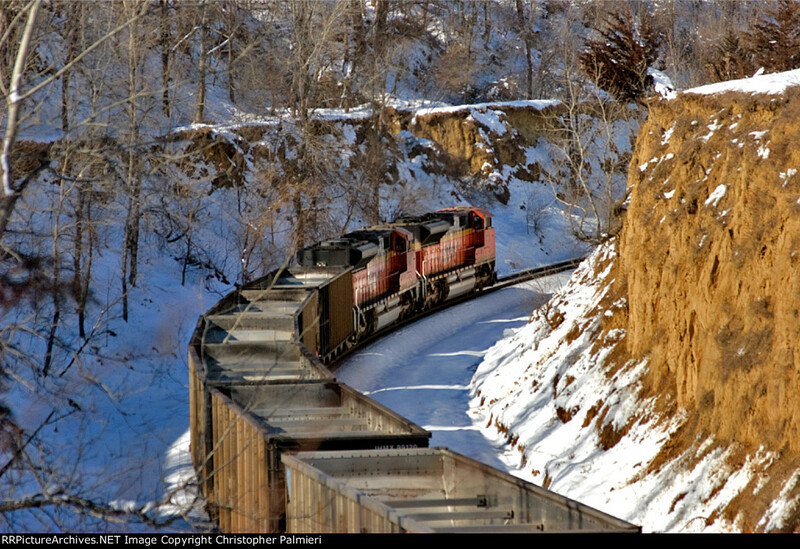 Empty Palos, AL to Coal Creek Mine, WY coal train E-PAMCKM0-02 leaves Iowa behind as it crosses the Missouri River and enters Nebraska. This train was routed up the Napier Subdivision to Pacific Junction where it enters the Creston Subdivision for movement to Lincoln. This is the preferred routing for empty coal trains out of Kansas City to minimize cross traffic of the St Joe Subdivision at Carling (east end of Lincoln Hobson Yard). SD70ACe 9131, SD70ACe 9149, 0 loads, 135 empties, 3233 tons, 7498 feet, rear DPU BNSF ES44AC 6344.